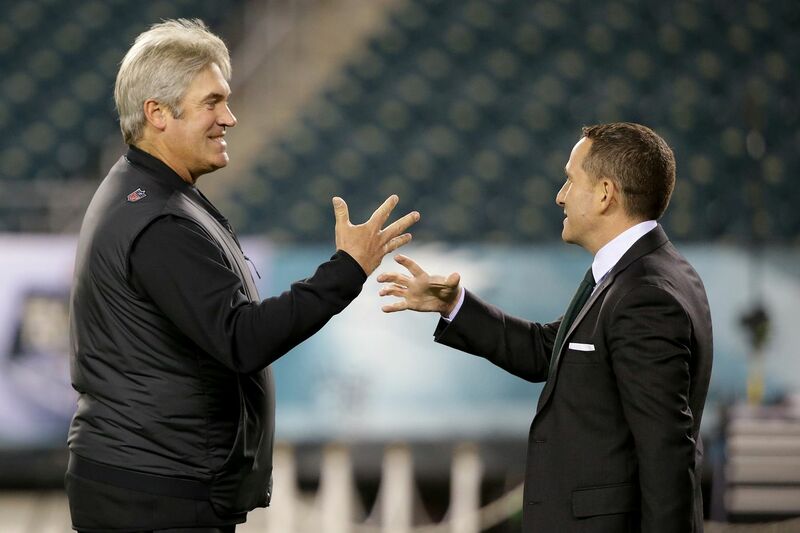 Eagles coach Doug Pederson, left, talking with Howie Roseman before a November game. Good morning. The Eagles' final practice of the week will be today at 11:50 a.m. They will leave for New Orleans on Saturday. Doug Pederson’s final press conference this week will be at 10:30 this morning. Top executive Howie Roseman (left) and Joe Douglas, vice president of player personnel, have a few new names on the Eagles scout team this year. One of the Eagles’ lessons about the 2017 roster was that roster building is not confined to the first week of free agency, draft weekend, and when rosters are cut to 53 before the season. The team must improve throughout the season when necessary. Some of those can be high-profile moves – think trading for Golden Tate this season and Jay Ajayi last season – but most of them are under-the-radar transactions that don’t garner headlines and include names unfamiliar to most fans. So when Cre’von LeBlanc is claimed off waivers and becomes the slot cornerback (check out Les Bowen’s story on LeBlanc); Treyvon Hester joins the practice squad and then earns a promotion and eventually blocks a field goal to save the season; Jordan Matthews, a player fans know well, is signed off the street and contributes at wide receiver; Boston Scott is signed off a practice squad to become the kick returner (check out Bob Ford’s column), it’s not a shot in the dark. It’s the front office – and especially the pro scouting staff – at work. Howie Roseman oversees the Eagles front office and Joe Douglas is in charge of the personnel department. Andy Weidl, the director of player personnel, also carries significant responsibility. The pro scouting staff is directed by Dwayne Joseph. Brandon Brown is his top assistant. In 2017, the Eagles added Jake Elliott off Cincinnati’s practice squad during the season. He helped them win a Super Bowl. Nate Sudfeld, who is one hit away from playing quarterback for the Eagles, joined the Eagles roster before Week 1 last year, too. Some of the moves come and go with little resonance. But other times, the Eagles can find a player who can help them get by during the season – and if they’re lucky, can remain with the team long-term. Jason Kelce left the first Saints game after only six snaps – a big loss in any circumstance, considering he’s an All-Pro center, but an especially crippling loss in a road game in a hostile environment. It gets loud at the Superdome and communication is so important for the center, with the Eagles working on a silent count and adjustments required at the line of scrimmage. In offensive situations during practice before these games, the team pumps in artificial noise to try to help the players prepare. But game day is a different animal, as Kelce knows. That’s why it helps to have Kelce back on the field this week. Pay attention to wide receiver Nelson Agholor on Sunday. Few players played well in the first Saints game, but it was the only game this season in which Agohlor failed to record a catch. (He was targeted only twice.) Agholor finished the season with three touchdowns in the last two games and played well in a three-catch performance last week. If he can play up to his standard Sunday, the offense will be better. The Saints have the NFL’s 29th-ranked pass defense, so there should be opportunities to move the ball through the air. Zach Ertz and Alshon Jeffery will be involved, but dynamic plays from Agholor give the Eagles the firepower they need. Les Bowen details Cre’von LeBlanc’s journey to the Eagles. The Eagles cannot afford to play from behind this week. That, and more, in Paul Domowitch’s notes. Should Carson Wentz be the No. 2 quarterback for the Eagles? Jeff McLane explores. The Saints will move the ball, but will they be effective in the red zone? Boston Scott, the Eagles' kick returner, will play his former team. Bob Ford has the story. Alvin Kamara isn’t adding fuel to the fire after his offseason comments about the Eagles, David Murphy writes. Mike Sielski writes about how Carson Wentz and Nick Foles are examples of the different ways to acquire quarterbacks. Marcus Hayes writes how the Eagles can win this game. McLane breaks down film to show how the Eagles can stop Drew Brees. Domo offers his Eagles-Saints scouting report. I don’t believe so. If the Saints are trying to score on big plays, so be it. Most teams would take their odds with that, I imagine. The Saints can be explosive, but it’s hard to score four or five touchdowns on big plays. More than likely, the red zone will be critical. The game will be won on third downs and in the red zone. Situational football is critical. It’s an emphasis, and the Eagles excelled in those areas during their winning streak. They were bad in those areas against the Saints. Every team focuses on red-zone defense – it’s not a novel concept that the Eagles emphasize it. But think about the first Saints game – four of New Orleans’ touchdowns came in the red zone. If those are field goals instead of touchdowns, it’s 16 points off the board. It wouldn’t have mattered that day, but those points could make a difference in most games.